Pro-Morsi supporters and Muslim brotherhood supporters are commemorating the Rabaa and Nahda sits in dispersal first anniversary in Egypt. Last year security forces dispersed by excessive force the Rabaa and Nahda sit in killing between 600-1000 from Pro-Morsi supporters on One day in one of the worst killing incidents in the history of modern Egypt. According to the Human rights Watch the act is likely amounted to become a war crime. It is expected that Tahrir square will be closed by security forces in front of traffic. Already there is an army tank there. Muslim brotherhood member Ezz El-Din Dowaider claims online that he got tips that "Unknown assailants" blocked 12 main roads and highways in Cairo and governorates as well the Metro in 3 stations. He also claims that those unknown assailants torched the Municipal buildings in Al Merg and Ain Shams as well the railway in Samalout. #المصريون / عز الدين دويدار:حتى الآن جائتني إشعارات عديده من صفحة رصد و غيرها . موثقه بالصور تحكي عن قيام المجهولين بقطع حوالي 12 طريق رئيسي في القاهرة والمحافظات تعطيلات لخط مترو المرج في 3 محطات إحراق مبنى حي المرج و مبنى حي عين شمس إحراق سيارات توزيع مؤسسة الجمهورية إحراق سيارات لضباط في 3 محافظات إحراق برج لاسلكي للشرطه في مدينة نصر إحراق خط سكك حديد المنيا في سمالوط ... وعدد آخر من العمليات .. اليوم يوم المجهولين هي الحكومه مش بتقبض عليهم ليه ؟! The Ring road in Al Waraq ring road. 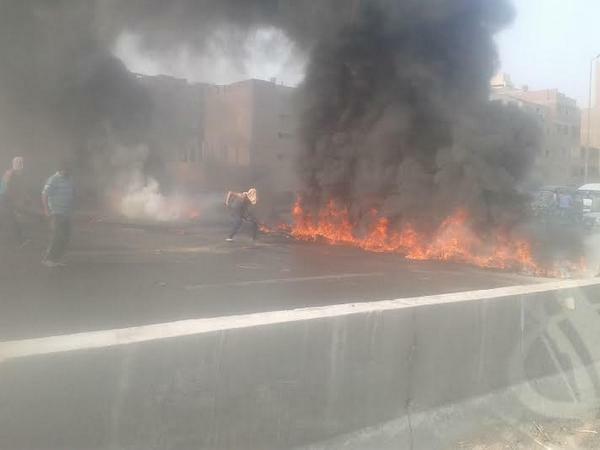 A live stream from Balteem-Kafr El-Sheikh showing the highway is blocked by torched tires. The security forces dispersed several Pro-Morsi rallies in Cairo , Giza and several other governorates arresting tens of protesters. Muslim Brotherhood led Pro-Legitimacy alliance claims that three protesters have been killed "2 in Giza and 1 in Sharkia"
Sorry for the lack of updates when lots of things happened in those few hours. I was tired and had to have some break. First of all the death toll increased from 3 to 6. The 6 victims are 5 protesters and one policeman. Four protesters were killed in Giza while the fifth was killed in Southern Cairo. The policeman was killed in Helwan which witnessed huge action. Now there is something interesting indeed happening in Helwan which is a popular MB area somehow. Suddenly a video appeared on YouTube for an armed masked group claiming to be "Helwan Battalion" claiming that they had enough of MB's peacefulness and they started to carry arms against the Egyptian police. 1- That video was removed moments after its initial upload but it was uploaded again on YouTube and Facebook. 3- They are not against the army but they are against the police. 5- Helwan is populated area so it is easy to identify those guys or at leas the guy speaking in the video using his voice. Many people are casting their doubts about that video.